There is a podcast called "How Did This Get Made?" which looks at cinematic disasters, but the title is mostly just an expression of astonishment and not an actual investigation. But when I see an especially unusual movie, I find myself actually wanting to know how it got made. Take "Alien Outlaw" as an example. It's the sort of movie that would, and did, end up being mocked on RiffTrax, telling of three space aliens who crash Alleghany County, North Carolina, steal a bunch of pistols and rifles from a sharpshooting show, and proceed to kill a bunch of locals before being hunted down by a trick shooter. But the film also features a cameo appearance from Sunset Carson, one of the great B-western stars of the 1940s, and a substantial role for Lash LaRue, one of the iconic movie cowboys of the 40s and 50s who was so famous for his skill with the bullwhip that he was hired to instruct Harrison Ford for the Indiana Jones films. The story of the film itself isn't that complicated. It is the product of Phil Smoot, a graduate of UNC-Chapel Hill who toiled away in the camera and electrical department of a series of films, starting in 1974, often working as a camera operator, who decided to branch out into writing and directing in 1984. This is a relatively common story and is responsible for many of our country's most entertaining film. 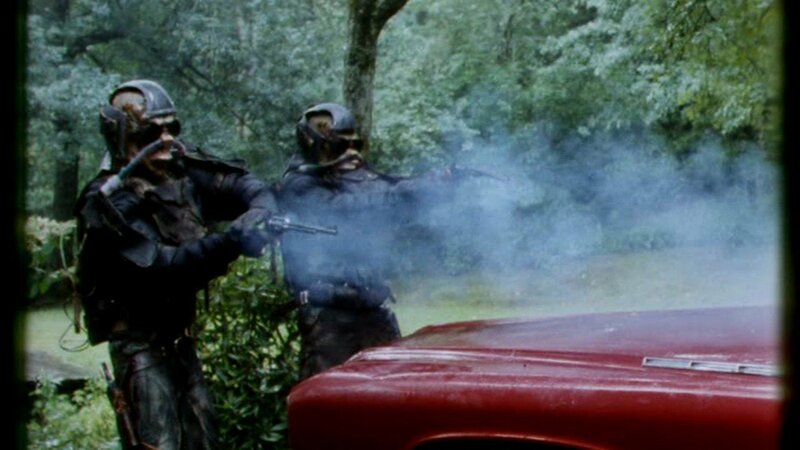 I always like it when people pull together enough money to make their own movie, and I especially like it when their films involve gunfighting space aliens. Smoot's North Carolina connections came in handy here. Because Coke Country had a history of bringing out Western stars from the middle of the 20th century: In 1982, the brought out Iron-Eye Cody, the actor most famous with the "crying Indian" anti-pollution television commercial, along with Lash LaRue. The same year, LaRue was part of the Western Films Fair in Charlotte, NC. As far as I can tell, this sort of thing had been going on in North Carolina for a while. Now, what I know of the story is that Smoot was working on a 3D movie, and Lash LaRue came by the set, and they met. I am going to guess that the movie was one of several produced by the Earl Owensby studio in Shelby, North Carolina, which was sort of a Roger Corman studio o NC, pumping out a dazzling selection of grindhouse films with titles like "Dogs of Hell" and "Chain Gang." The studio produced six 3D film in the 80s, and Smoot is credited as a camera operator on most of them. In fact, I bet I can guess which movie it was: "Chain Gang," which features LaRue in a small role. And so Smoot met LaRue and convinced him to appear in a low-budget film, which I imagine LaRue was amenable to. He was in South Carolina a couple of times per year anyway, and had not had a significant role in a film since 1972. Believe it or not, the film they made was not "Alien Outlaw." Not at first. No, Smoot and LaRue made a film called "The Dark Power," about an Indian curse and an exorcist with a bullwhip that I now feel like I need to see. But "Alien Outlaw" has the more overtly Western theme, not simply because it is about a Wild West-style gun show and features Sunset Carson playing, as far as I can tell, himself, but also because the space aliens dress in black, ride horses, and also do gun tricks — one twirls his pistol every time he shoots. It's an odd film, one whose presence on RiffTrax is not unearned. The films' real star is Kari Anderson, who is not an actress — her film credits are mostly for working in the makeup department. She seems to be in the film mostly for being game for doing whatever the film demands, but it mostly demands she run around in a fringed buckskin costume that legitimately looks to be bottomless. She plays Jesse Jamison, the film's trick shooter, but the film never gives her the opportunity to do any trick shooting; I'm guessing she wasn't really a trick shooter, but it's hard to know. LaRue never uses a bullwhip in the movie, so perhaps Anderson is a skilled gun-twirler or can shoot coins out of the air and it never occurred to the filmmakers to show it. There is a surprisingly complicated b-story to the movie, in which the trick-shooter is looking to trade management companies, and this is always in the background, to such an extent that it seems like the film must end with Jamison proving her worth to the new management company. But, no, it gets dropped and forgotten. Instead, the film mostly focuses on the trio of aliens. 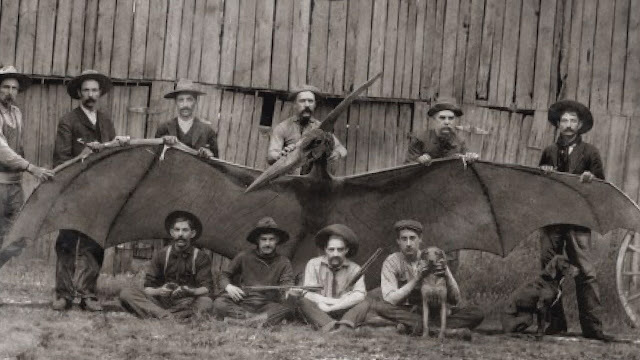 There is some indication that they are Predator-style hunters, but they seem to be especially lazy versions, as they neglect to bring their own weapons and so must steal some, and they also hunt a collection of redneck stereotypes that are no match for the aliens whatsoever — most don't even shoot back, although all are armed. The film mostly seems like a collection of missed opportunities. I'm going to do something that you're not supposed to do right now. I used to give feedback at playwrighting festivals, and we were never supposed to give suggestions for how to rewrite a script. But screw it. Imagine the film had been set at one of these North Carolina Western festivals. Imagine that the aliens showed up because their exposure to earth came through transmissions from television, and they mostly watched Westerns, convinced that these were documentaries. Imagine that the specifically came to challenge the stars of classic Hollywood Westerns to duels. And these classic Hollywood stars are old. Some of them never really had any sort of skills — stunt men did all their onscreen action. Some of them actually do know how to handle a gun, and are a bit pompous about the fact, but severely underestimate the skill it takes to win an actual gunfight. These aging stars are picked off early and pathetically. But there are some, like Lash LaRue, that really knew their weapons. And maybe some enlisted during the war and saw action. And suddenly the aliens find themselves in a real fight, one that maybe they can't win. Maybe it's time we made that movie.